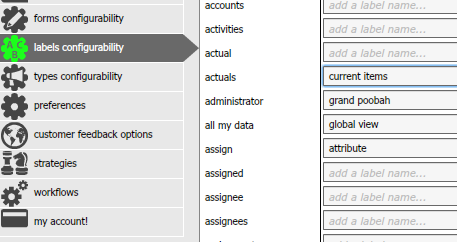 Yesterday, we were very pleased to introduce our latest feature inside OneDesk, labels configurability. You’re now able to create personalized labels and apply them to all your processes across the entire application. It’s a great new way to keep you organized and tailor your work items to reflect your organizations culture and strategic vision. There’s a lot of creative ways you can apply this to your business, for example, if your focus is agile you can customize labels to represent “user stories” or “sprints”. 1. Click on the user settings icon in the top right hand corner of the main application. 2. Select labels configurability from the menu on the left. 4. Rename the selected label by typing the new term into the corresponding custom label word box. Changes are updated dynamically and in real-time.